Tell the world you appreciate telegraph poles and all the things that hang from them, stand on them, nest in them, gaze up at them, by becoming a member of The Telegraph Pole Appreciation Society. And what’s more, there is a badge, certificate and even a pencil that in certain light could look like a telegraph pole, all available to say that you’re a member. For life, too. 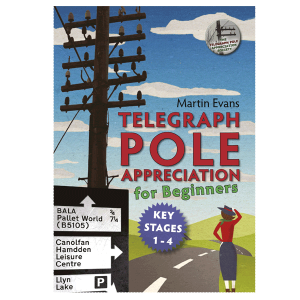 There is a one-off cost of just £3.00 to join the Telegraph Pole Appreciation Society. This fee covers the cost of the badges, pencils, printing and postage. We don’t give your details to anyone else, and we probably won’t be stuffing your email inbox with endless newsletters either. MEMBERSHIP OUTSIDE THE UK. Alas our membership packs replete with certificate, pencil & badge are classed as a parcel by the post office and so cost us a bomb when posting outside the UK. Therefore we can no longer include anything sticky-outy in packs sent to addresses outside the UK (or Basingstoke). If you are abroad and want the pencil and badge too, then please contact us first. PLEASE NOTE: It may be that you need to set your Internet Privacy Settings to ‘Low’ or ‘Accept All Cookies’ if you experience difficulties with the payment button. Okay, so what do all these engravings, plaques and embossed badges mean? * S = suspected of decay. * red D = decayed. * green C = not planted deep enough, shallow, climbable. * The cuts in the pole are measurements to do with depth in the ground, also they tell you the size of pole ie 32 m is 32 feet long medium size pole as there was light L or heavy H sizes, 60 H would have been 60 feet long Heavy, thick pole. All to do with loading. * The numbers at the bottom are date of manufacture 86 = 1986. They use meters as measurement now. And apologies to John for taking well over a year to putting this info on the site. The doby mark or the 3 metre mark (details branded into the pole including pole owner BT, date of manufacture & pole size) is 3 metres from the bottom of the pole. A pole should be planted approx 1.8 metres in the ground which would then put the 3 metre mark at aheight of 1.2 metres from ground level. New poles do not need “testing for the first 12 years and hence after require testing by a “pole tester” every 10 years. If a pole is “out of test date” then you are not allowed to climb it and must use a platform elevating. (Left) Sir Benjamin enjoys a cigar on the touchline prior to the excitement of the game. Seen here with his gentleman assistant, Huw Thayer. (Above) Enjoying another, or possibly the same cigar alongside the last person who ever knew where the bloody net was at Wrexham, Gary Bennett. Also seen alongside is someone with a severe skin disorder and hideously deformed head. Wrexham captain, Ashley Westwood, listens intently to tactical advice imparted by Sir Benjamin. Had they heeded said advice, the result would have been a resounding thrashing for the opponents. Sir Benjamin offers to clean man of the match, Andrew Crofts’ shirt of all the felt-pen scrawling. Or rather, his manservant, Huw Thayer, will clean it. And in his own time too. You can become a member of this august organisation by clicking here. A telegraph pole farm in the Orkney Isles. The Orkney Isles are the source of most of the UK’s telegraph poles. Telegraph Pole Farming is a mainstay of the economy in these harsh northern isles. The posts seen here are nearly ready for harvesting. Every autumn, migrant workers from Eastern Europe work night and day picking only the tallest, creosotey poles with the most succulent insulator fruit. Before you think they’re just dull sticks with wires, take a look at Cerrigydrudion High Street below. For the second picture we popped over to a parallel universe where electricity hasn’t been invented. Apart from the football differences, I prefer our universe version of Cerrigyrdudion with all its aerial clutter. I forgot to say, a pint of Timothy Taylors is 1,550 Euros in the parallel White Lion.